Register for the DuPage Human Race today! DuPage Animal Friends strives to strengthen the lifesaving, compassionate and innovative initiatives at DuPage County Animal Services. We partner with the shelter to understand the needs of our community's animals, providing financial resources and advocacy on their behalf. 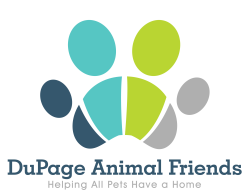 Our vision is that DuPage County will be a community where all pets have a home.